An effective manhunt by authorities from the Belize Central Prison has resulted in the successful apprehension of two of the three inmates who eluded the confines of the Wagner’s Youth Facility located inside the prison compound early Sunday night. After less than 48 hours on the run, around 2:30 p.m on Tuesday, Hector Garcia, 17, was reportedly caught between Miles 27 and 28 on the George Price Highway. This was after the group of three was spotted moving together by an alert motorist who informed the authorities. The officers, however, were only able to capture Garcia at the time. Garcia, who is of Guatemalan nationality, was remanded on immigration charges. Incidentally, he was to be deported this past Monday. According to reliable reports, another of the three escaped prisoners —Wilmer Guzman, 19, a Belizean, was captured approximately four hours later that same evening, also on the George Price Highway around Mile 30. Guzman was serving a 6-month sentence for theft. 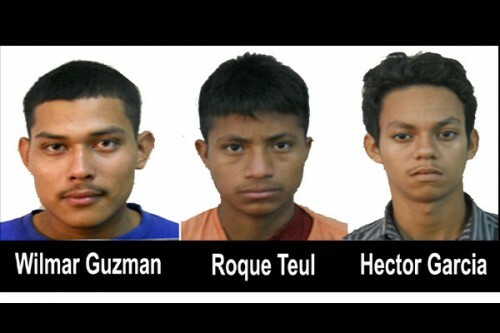 Although these two have been swiftly detained, authorities have not yet recaptured Guatemalan national Roque Teul, 17, who remains on the lam. Teul was serving time for a firearm offence. The three inmates got away around the time of a shift change and investigations are taking place to ascertain whether the prison break was due to negligence on the part of the guards or a carefully executed getaway staged by the inmates themselves. The public is reminded to be careful about whom they pick up along the George Price Highway at this time, and to call 610-0649 or 610-0805 or the nearest police station if they have any information regarding the whereabouts of the remaining escapee.